So, now that we've decided on the finest Mexican handmade tiles for our wall, all we have to do is design the pattern !! Designing a tile wall pattern can be a frustrating, long-winded affair where you buy some samples, lay them out on the floor and then try to extrapolate a design to cover the whole wall. Alternatively you could print out photos and arrange them on a grid - an equally laborious process. Our new Tile Wall Designer application is here to help and hopefully will make the whole process simple, fast and enjoyable. Just measure your wall height and width in centimeters and enter the measurements in the relevant boxes below. The new window which appears will show your empty wall and all the 10cm handmade tiles currently available. You can then design your wall using simple drag & drop movements. 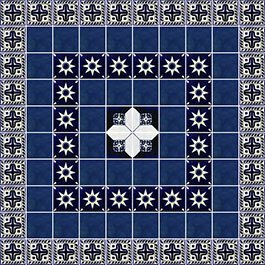 A wall designer for handmade tiles. Do you have a specific wall in mind? Enter the measurements here and we'll open a new window for you where you can 'drag and drop' our handmade tiles to your heart's content. You can specify a wall upto 999cm by 999cm. Click on the 'create my wall' button and we'll open a new grid in a separate window - just for you !! The Tile Wall Designer is a great tool allowing you to quickly and easily design a pre-measured space with tiles from our range. You might also be interested in our Tile Randomiser where you can experiment with randomly generated designs. These can be very effective and eye-catching due to the inherent asymmetry and disorder.